Shop Nashville Fashion Week at Stacey Rhodes Boutique with Chicago designer, Lagi Nadeau! Straight from the Nashville Fashion Week runway to Stacey Rhodes Boutique! Meet Chicago fashion designer, Lagi Nadeau, and shop her Spring/Summer Collection. The LAGI NADEAU collection blends high-end sophistication with feminine styling. This distinct style is emphasized by the designer's use of luxurious fabrications mixed with interesting detailing. Nadeau creates high quality, authentic pieces made in the USA, for women who have a strong sense of self and style. LAGI NADEAU designs have been featured in publications like Marie Claire, WWD, Vogue Knitting, VIBE, CS, and Refinery29. Nadeau has been awarded with the 2014 Fashion Group International of Chicago's Rising Star Award in the women's apparel category and is an alumna of the Chicago Fashion Incubator at Macy’s. Enjoy Wine & Champagne while you Shop Nashville Fashion Week! Nashville Fashion Week designer, Lagi Nadeau, is a perennial favorite! 16th Annual "An Affair of the Hat"
Dozens of exquisite hats for women & men, at all price points, will be unveiled from designers around the world for the Iroquois Steeplechase, Kentucky Derby or any occasion! This iconic event will have an international flair this year with chapeaux from Paris, Melbourne, Los Angeles, New York & Palm Beach! Join our Honorary Co-Chairs, Whitney Daane (DAANEgerous Entertainment), Danielle Breezy (News 2 Chief Meteorologist) and Joe Breezy (106.7 Brand Manager/On-Air Afternoon Host) for what is sure to be our most exciting and fun event ever! Renowned Palm Beach Milliner, Carol Carr, is our Special Guest, and will be available for consultations for custom hats. Please feel free to bring your dress, if you already have it, or we can style your hat with a dress from the boutique. Enjoy wine and champagne while you shop with a percentage of every hat sold, until the Steeplechase and Derby, benefiting The TJ Martell Foundation! Photo by Adrian Morales taken in The Hermitage Hotel Ballroom of Emily Grace King wearing a custom made hat by Palm Beach milliner, Carol Carr, and dress from Stacey Rhodes Boutique. Photo by Adrian Morales featuring a fascinator by Los Angeles milliner, Arturo Rios, and dress from Stacey Rhodes Boutique with model Emily Grace King. Model, Emily Grace King, wearing a beautiful floral and butterfly headband by Los Angeles milliner, Arturo Rios. Photo by Adrian Morales in The Hermitage Hotel Ballroom. 15th Annual "An Affair of the Hat"
Please join us for our 15th Annual "An Affair of the Hat" featuring dozens of exquisite hats for the Steeplechase, Derby or any occasion! Our Special Guest, Palm Beach Hat Designer, Carol Carr, will be available for styling consultation and custom hats at the event, as well as Friday, March 31 & Saturday, April 1. This year's Honorary Co-Chairs are Big Kenny of "Big & Rich" & stylist, Christiev Alphin with hat lover, Whitney Daane, DAANEgerous Entertainment, so it will be a party! Wine and champagne will be served with a $10 donation at the door and a percentage of all hat sales benefiting The TJ Martell Foundation. Please feel free to bring your dress or shop our lovely selection in-store. Our team will be on hand to style the perfect outfit. 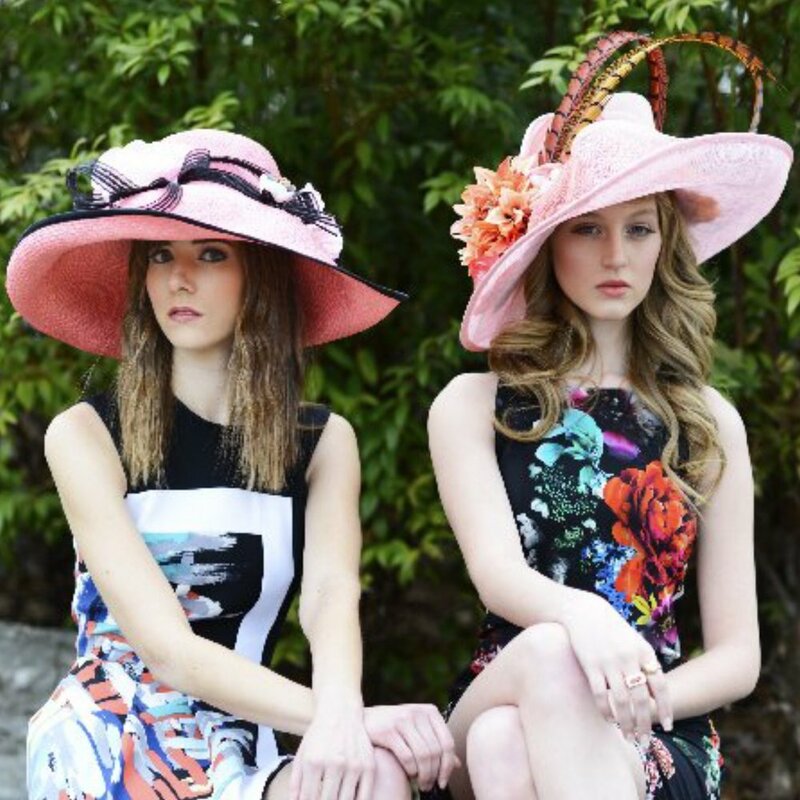 An amazing selection of hats for women & men in all styles, at all prices, will be available until the Derby and Steeplechase from our talented group of six designers. You won't want to miss the hat event of the season! With a $10 donation guests may enter our drawing for a beautiful handmade labradorite necklace with a gold vintage Chanel pendant by Dallas designer, Catherine Page, valued at $368. The first 25 guests to purchase a hat will receive a gift bag filled with lots of great products and goodies!